Order-taking, CRM, load-planning, routing, dispatching, tracking, document management, and more. You can gain a competitive advantage over your competitors because a tailored solution from Stratelogics can leverage the unique strengths of your business. Logistics are complicated and each business has their own particular needs. Off-the-shelf systems try to be a one-size-fits-all solution but simply cannot. 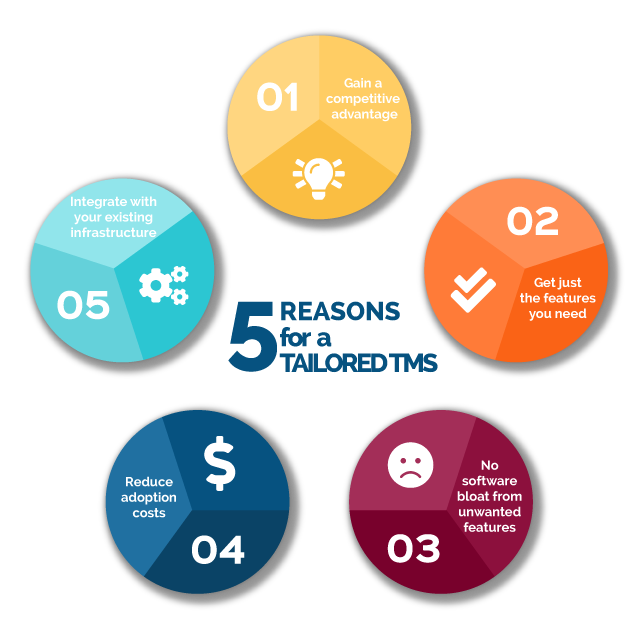 Only a tailored TMS from Stratelogics can meet your exact needs without compromise. In order to meet the needs of all customers, off-the-self solutions include all kinds of features that you don't need. These features just get in the way and you end up with a bloated system that distracts from day-to-day needs. Off-the-shelf solutions force buyers to adapt their business processes to the software instead of the other way around. A tailored TMS avoids costly organizational and business process changes. A tailored solution can be integrated into any existing system that your business uses. Have a perfectly good CRM with years worth of customer data? Let Stratelogics integrate our solution with it to reduce the cost of adopting a new TMS. Stratelogics tailors the right TMS for you using our extensive set of FreightFlex™ software modules. These modules have been developed over the course of 7 years of developing TMS software for customers and cover all aspects of TMS. FreightFlex™ includes modules for flexible and powerful shipment tracking, a customer portal that includes self-serve reports and tracking boards, and even an API that can be exposed for your larger customers. User interfaces (UI) created with FreightFlex™ are responsive and easy to use. Feedback from our customers is used to continually improve the efficiency of data entry. We believe in taking the time to create a user interface that is intuitive, easy to use and pleasant. This leads to better productivity and happier users. A tailored TMS adapts to your business - not the other way around. This saves business process re-engineering, training, and retrofitting costs. Combined with our cost-effective hosting plans, a tailored TMS is within reach of even small businesses. Rather than hosting on your premises, you can take advantage of our turn-key Adaptive Hosting™ service that guarantees 99.99% up-time. Adaptive Hosting™ scales automatically as your business grows and to handle busy periods. Access your data to extract business intelligence or let us develop customized management reports for you. We ensure that our customers are completely satisfied with our services. If they are not, we will do whatever it takes to make it right. Most custom development firms only provide 30 or 60 day warranties on software. At Stratelogics, we warrant our software against defects indefinitely. Our customers need to know that support is available when they need it. Stratelogics has 8/5 to 24/7/365 phone, email, and live chat support plans available.